Things I have found to be cheaper in my local shops. The other day on Twitter I exchanged a few tweets with someone who was worried that food would be more expensive outside the supermarket. Well Team Pugh showed that shopping outside the supermarkets can save you money by saving over £850 on their year of going supermarket free. 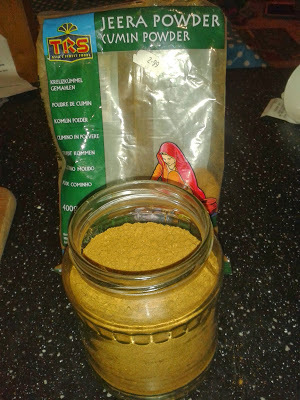 Cumin (something I like to add to my houmous) £2.99 for 400g vs £1 for 46g (£8.70 for 400g) in the supermarket. So on these products I spent approx £19.67 in my local shops vs £43.11 I could have spent in a supermarket! I have found some of the best places to shop for store cupboard ingredients are the specialist shops – I’m lucky to have a Middle Eastern food shop, a Chinese food shop, Polish food shops, and a Thai food shop not far from my house. Rice, noodles, spices, authentic sauces and products are easy to find in these shops and if you pick the right things you may be surprised to find how much cheaper they are than in the supermarket! This entry was tagged cheaper, eco, Frugal, Green, money savings, supermarket free, thrifty, year of eco challenges. Bookmark the permalink.